Two physios say the idea that back pain is a result of a weak “core” is wrong and must be corrected to better manage the complaint affecting thousands. This is gonna’ be good, they’re really going to take the idea apart and provide the public with some robust science. In fact, years of core strength exercises could be making a person’s chronic back pain worse, says musculoskeletal physiotherapist Professor Peter O’Sullivan from Curtin University. He says people with back pain are already too rigid. Their muscles have tensed up as a protective response to the pain and core strength exercises can be counterproductive. “The common belief around tensing up a structure that’s already tense doesn’t really make sense,” Prof O’Sullivan said. According to physiotherapist Professor Paul Hodges, from The University of Queensland, the myth that core stability equals a stiff spine needs to be corrected to better back care. He says too many people “wrongly” believe that a weak core leads to back pain. It’s a fear that has been fuelled by those in the fitness industry who heavily advocate core building exercises as a way of managing the common pain complaint. Professor Paul Hodges, isn’t he the guy… the one that in the past was all over Transversus Abdominus… This is great, keep talking. While core stability exercises are easy to teach, they involve very little movement of the spine, says Hodges. “The Plank” exercise for example involves a person on their elbows and toes while holding their body stiff for a period of time. Many pilates studios also involve people lying still on what is known as a reformer bed while holding their spine rigidly in place. 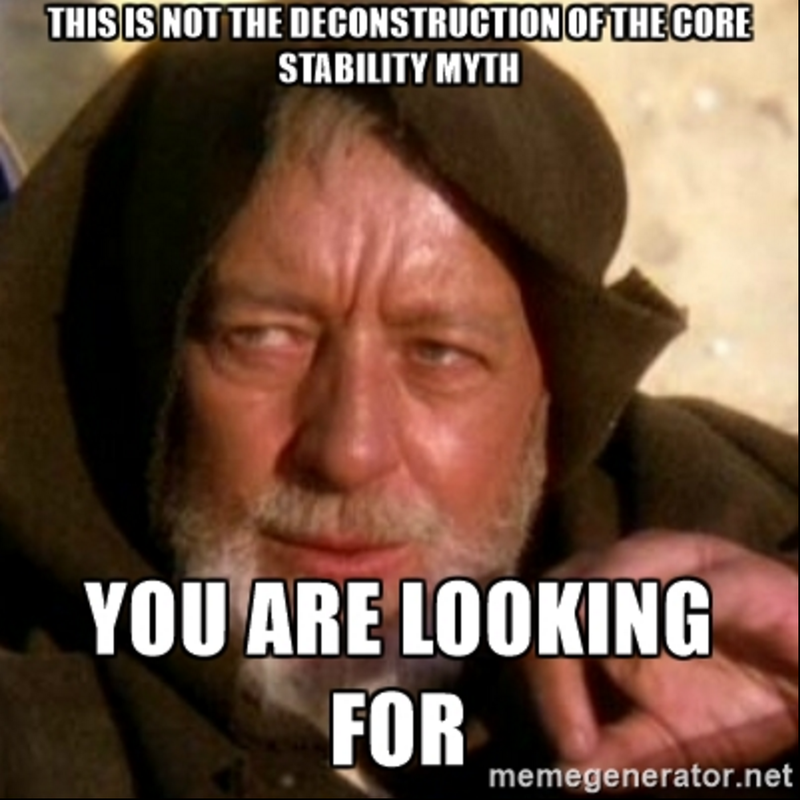 That’s not what core stability means, says Prof Hodges. Keep going, I’m just about to revise my faith in humanity, the therapy profession, the world…. “Core stability is getting the balance between movement and stiffness. “If you think about most functions, they actually need the spine to move,” he said. This blanket idea that exercise should just be about stopping people from moving their spine is only half of the story. Prof Hodges says some people do move too much and need to be controlled a little more and vice versa. Reading this short article I am not sure what message you are trying to send? Could you elaborate? Sure, no problems. Yesterday I wrote about an interview by the Canberra Times of Lorimer Moseley. I think this interview completely missed the point of what Lorimer was trying to say – others may disagree. Then I saw the headline “Dismantling ‘the core’ to better back care” and the two eminent physiotherapy researchers/communicators that were quoted, and had real hopes that the article might provide a good deconstruction of the whole ‘core stability’ thing in a public forum. The statement attributed to Professor Hodges “Prof Hodges says some people do move too much and need to be controlled a little more and vice versa.” seemed to me to be leaving the door open for more ‘motor control’ and specificity in exercise. He went on to say “A lot of fitness programs are designed for healthy people to function, to get fitter. What’s a problem is if someone’s got pain just doing a conventional program may not be the right thing, you need to have it specifically changed.” Which further erodes any ‘dismantling’, at least in my mind. It was not the deconstruction that I was hoping/looking for in an article intended for the lay public. I attended a CFT course a year ago in which the instructor (Wim Dankearts) explained how individuals with a spondyolisthesis may want to “control” their movements more by avoiding end range positions. He wasn’t suggesting to avoid movement in general or to “stiffen the core” as is so common, but there was a suggestion that some individuals may need to be more wary of movement because in their particular case there may be some credible threat involved (my interpretation). I admit I thought it made sense for this particular group. Understanding that spondyolisthesis is only a very small portion of those individuals with low back pain (and that many low grades are asymptomatic) do you think there is room with these individuals for the type of approach Hodges apparently advocates for in that last quote? You raise a great point. I don’t know the answer, it seems like it could be quite arbitrary to determine what end range is for any particular person – what is ‘safe’ and what might be going beyond safe. What credible threat do you think there might be towards end range for these people? Is there a risk that as clinicians we are iatrogenically constructing this credible threat? Just my opinion, but I’d prefer to have people feel free to move in whatever way feels right for them, as well as have the confidence to explore all movements. Would Andre Agassi have been as successful a tennis player if at a younger age he’d been advised to be wary of certain movements? Or maybe he was, and that was the secret to his success!